I take my workout outfits seriously. You’d never know it from the rest of my wardrobe. So, imagine my dismay when I walked into Lululemon yesterday and found that their spring colors are similar to the other hideous pastel-ish neon shades I’ve been seeing everywhere. I almost turned around and walked out but I really wanted a new running shirt like the other one I purchased shortly after Baby A was born. I wear it several times a week and I don’t do wash several times a week. Enough said. My mission was to find a shirt of the same design one size smaller in a nice blue or green. Nope, the least offensive of the offensive colors offered was a peachy thing. I grabbed a few pairs of running shorts (it’s too warm for my usual tights these days) and found a dressing room. I had only 15 minutes before swim class and hadn’t bothered to put Baby A in his stroller so the second I plopped him on the floor beside me, he made a quick escape under the door and delighted the salesgirls with his surprise appearance. The man in the dressing room next to me was less excited to see a baby head appear under his door. Luckily I had enough clothes on to swoop in and grab Baby A before he completely disappeared into this man’s dressing room. I’m sure I’ve never made such quick decisions to spend so much money on workout clothes before. Not sure I even looked at the prices. I took a shirt, a pair of shorts and the pretty pink long sleeve pullover the salesgirl brought me. I figured if the clothes didn’t work, I could bring them back. Fast forward to another gloriously sunny day today. I donned my new bright running outfit and realized I’d forgotten all about the slippery material rule. If two items are made from slippery materials and they rub together, they will not stay in place. I spent my entire run yanking my shirt down as it rode up and exposed my belly. Too late to bring it back. 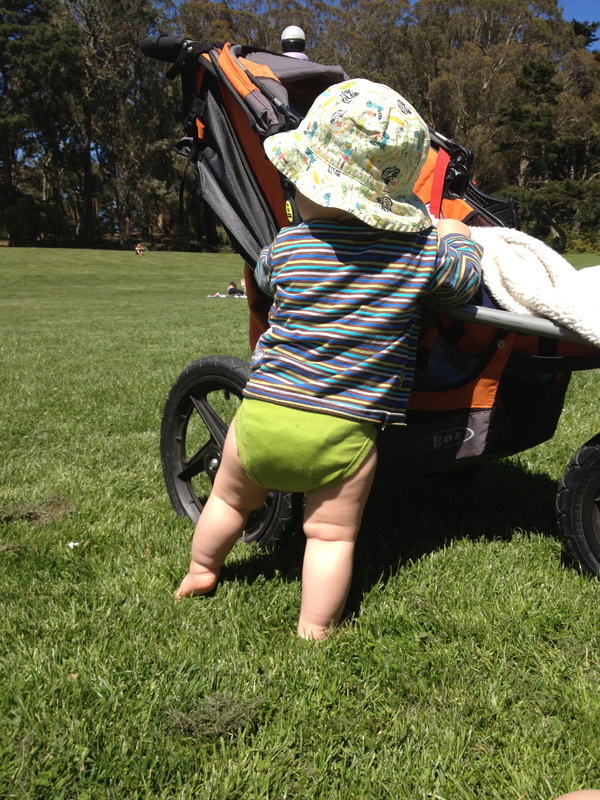 Baby A refused all napping attempts today until finally, after he’d crawled up and down a hill in the meadow and showed off some new ballet moves, he was ready for his nap and I was ready for a run. 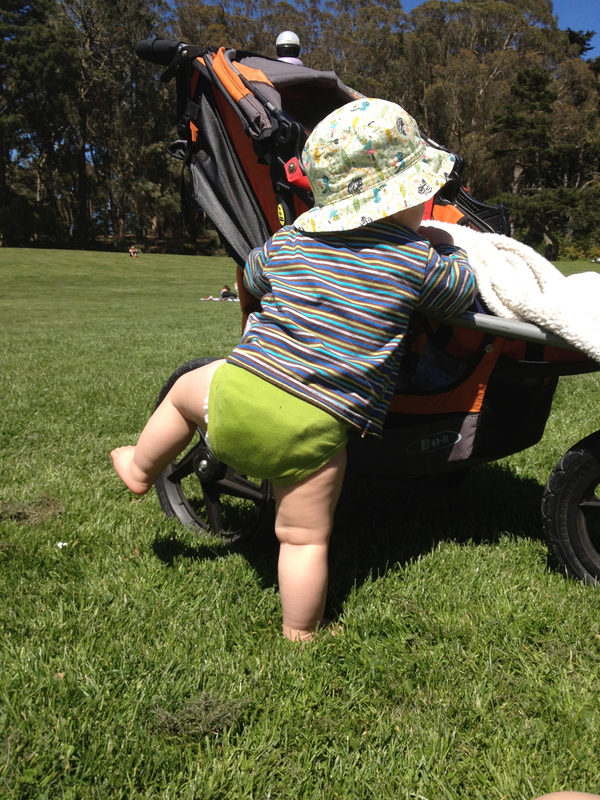 Unfortunately I’d forgotten after Monday’s run that the stroller tires were going flat. Ugh. Must remember to pump up tires first thing tomorrow morning. I made it to the beach and back before he woke, then he opened his eyes just in time for me to strap him into the car and race to the Y. My favorite Pilates class is Wednesday afternoons and I almost never go. Today’s class was a perfect combination of work and stretch. I tried for the entire class to remember the order of the exercises so I could do them again on my own. I retured to childcare and found Baby A screaming and one of the caregivers trying to wipe his nose (probably the reason he was screaming). I smiled, picked him up and gave him a hug. All better.